Use Report Settings to control which items and which date range are to be displayed. Report contents can be exported to a spreadsheet for further analysis. 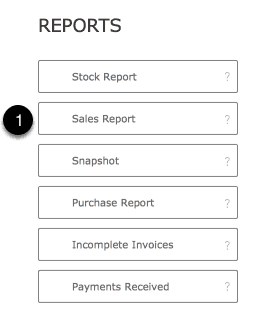 Move to the People Component where all the clients involved in the displayed sales will be displayed. Move to the Artwork Component to the list Screen where all artworks displayed will be displayed. If amounts payable are required to be made on the sale of artworks then the totals are included giving a more accurate result for the amount received from sales. This icon indicates an amount is payable on the sale of this artwork. Use the icon to reveal more details. Artworks can be sold by adding them to an invoice or by manually marking them as sold from the Artwork Stock/Sales screen. Use this buttons to reveal more sales details. See more details on the individual items sold by using this button.